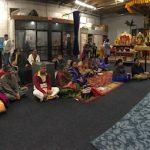 By the immense grace of Sri Swamiji, Sri Ramanujamji delivered an impactful lecture on the greatness of NamaSankirtan on Tuesday, October 9th at Sri Hanuman Mandir in Atlanta. 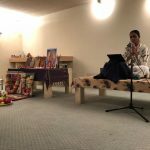 He talked about the simplicity of this path and that there are no regulations for chanting the divine names of the lord. 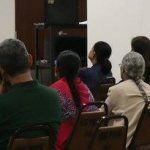 He exhorted the audience to chant the divine names of the lord a few times daily. 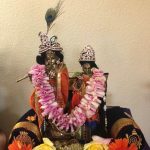 The path of Namasankirtan is shown by many Mahans and is indeed a pragmatic path to be followed by one and all in this Kali Yuga. 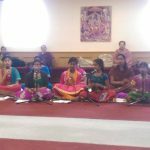 The devotees performed Namasankirtan joyfully during the closing session. 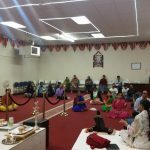 On Monday, October 8th 2012, GOD Chapter of Atlanta organized a ‘Madhurasmrithi’ satsang at the residence of Sri.Venkatji and Mrs.Jayaji. The satsang began with Namasankirtan and following this, Sri Ramanujamji shared some of his divine experiences with Sri Swamiji. About 30 people took part in the satsang.